TheraMind® Center of Santa Monica is an outpatient neuropsychiatric clinic providing Transcranial Magnetic Stimulation (TMS) and other cutting-edge neurological and psychological services to patients in the Los Angeles and Santa Monica area. 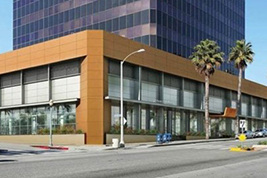 The Center is conveniently located on Wilshire Boulevard, roughly mid-way between the Pacific Coast Highway and Route 405. TheraMind Center of Santa Monica works with prescribing physicians to design a treatment program tailored to the individual needs of each patient. Under the supervision of our Chief Medical Officer and Medical Directors, our TMS Specialists provide a safe, non-invasive and effective outpatient procedure that has helped thousands of patients who have not responded well to drug therapy. Dr. Sheldon Jordan, MD, FAAN oversees the administration of TMS therapy for patients at the TheraMind® Center of Santa Monica. Doctors Jordan and Franc are widely recognized as leaders in brain imaging using functional magnetic resonance imaging (fMRI) and TMS targeting techniques to treat Major Depressive Disorder and other neurological and psychological disorders. Dr. Jordan graduated from Brooklyn Tech in Industrial Design and completed his premedical studies at Harvard University. He majored in art, psychology and natural sciences at Johns Hopkins and was a Goldwyn Scholar and graduated from UCLA Medical School with the Upjohn Award for best student in combined research and academics and the Gold Medal in Surgery. Thereafter, he undertook his Medical Internship, Residency, and Fellowships in clinical neurophysiology while staffing the electroencephalography laboratory and electromyography laboratory. Dr. Jordan has also taught at UCLA and USC as Clinical Associate Professor; helped found the Stroke Service at UCLA; and participated in some of the early work in surgical monitoring, brain mapping and evoked potential physiology. He has been in private practice in Westwood and Santa Monica since 1981 with emphasis on interventional pain management, neuroimaging, clinical neurophysiology and sports neurology. Dr. Jordan is also a neurology consultant for US Soccer Men’s and Women’s National Teams, Major League Soccer, professional boxing and the NBA. Our independent, state-of-the-art, neuropsychiatric TheraMind® Service Centers, located nationwide, are dedicated to offering all mental health professionals, referring medical doctors and their patients one of the most advanced options for treating Major Depressive Disorder, Postpartum Depression, anxiety disorders including OCD, PTSD, General Anxiety Disorder and other mood disorders. Many of our Centers also treat a broad range of neurological disorders including Migraines, Chronic Pain, Fibromyalgia, Tinnitus, Concussion and TBI and Stroke related disorders. To learn more about the disorders we treat here at TheraMind® Center of Santa Monica, visit our Treated Disorders section of our site or call us today at (847) 562-5868. TheraMind® Offers Hope. Get the Results You’ve Been Looking For—CONTACT US NOW!